The CONTROL UNIT 01 has one (1) connector socket for one the below shown heating elements or a temperature probe. The CONTROL UNIT 02 has two (2) connector sockets for one or two of the below shown heating elements or 1 element and a temperature probe. The CONTROL UNIT M/S has two (2) connector sockets for one of the below shown heating elements and a temperature probe. The temperature setting for all Control Units range from 28o°C to 42o°C . The heating elements heat up to a specified temperature and then maintain this temperature. 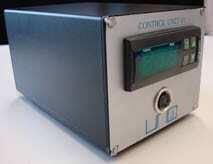 The Control Unit M/S integrates the temperature probe and heating device. 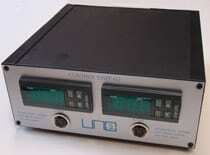 The unit can be set to maintain animal temperature measured by rectal probe. For temperature control of rats during a prolonged period during procedures under anaesthesia such as cardiac flow measurement, during repeated blood sampling from the tail with the tail heating device, or other prolonged procedures. For use in procedures with blood sampling, with or without the “half-pipe” heating system. Aluminium add on to the flat heating plate helps keep up to 4 mice in place. This can be used with the UNO Multi Face Masks.